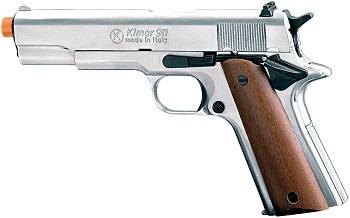 Image Below Or Add To Cart Front Firing Kimar 1911 Blank Firing 9MMPA 1911, Nickel-Wood color. Our New Front Firing 9MMPA Blank Gun Fires Flame and Smoke from the Front end of the Barrel. ALL Blank Guns Sold in America must have the red tip at the end of the Barrel though it is my understanding that if the item is used in the theatrical, movie, or television industry the red tip can be removed making this 1911 Front Venting Blank gun excellent as a stage or movie blank gun. The 1911 is the classic and historic sidearm used by American soldiers for over 80 years. The 1911 Colt 45 could be the most recognized hand gun ever made. Modern 1911 variants are still in use today by some units within the U.S. Army Special Forces, the U.S. Navy and U.S. Marine Corps. It is great for WWI and WWI reenactors, as a movie prop gun, military or police training and collectors and hobbyist. Our 1911 Blank firing replica gun feels looks and operates just like a real gun. It is made of metal not plastic. It automatically ejects and reloads when fired just like a real automatic hand gun will do. It comes complete with a magazine and a hard-shell carrying case. Length: 8.5", Weight: 2.5lbs and Fires 8 Rounds. This is the Kimar 9MMPA Model 1911 Blank gun, Nickel with Wood Grips.